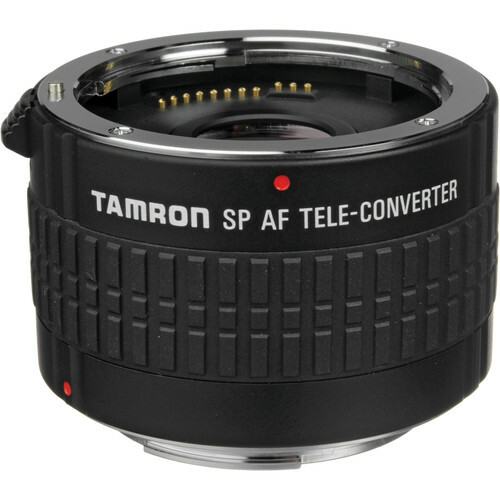 TheSP AF 2X Pro Teleconverter for Select Nikon Lenses by Tamron features improved optical construction and is designed to be used with lenses that are f/4.0 and of focal lengths of 90mm or greater. The 2x teleconverter (also known as a tele-extender) will multiply the focal length of the existing lens by 2x, and will cut back the amount of light by 2 f/stops. For example, using a 2x teleconverter with a 300mm lens will effectively increase the focal length to 600mm. A lens set to f/2.8 will now be f/5.6. This teleconverter is not recommended for lenses wider than 90mm, e.g. 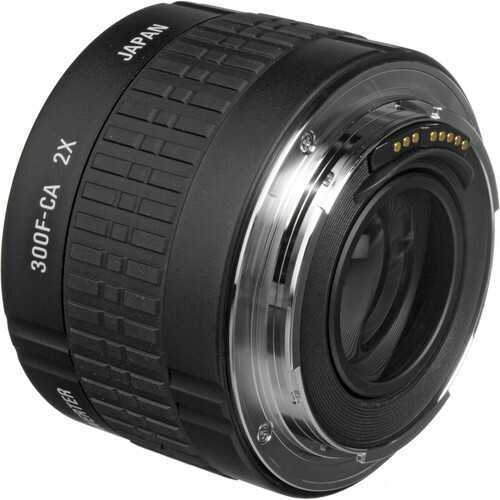 50mm, 28-105mm, etc. However, full AF operation is still only possible with lenses with open aperture of f/2.8 or brighter. Please be aware that AF will work properly only if there is enough light and contrast on the subject to activate the camera's AF sensors. Manual focusing is recommended when using lenses with smaller open f-stop value than those given above. This teleconverter is compatible with the EF lens mount only--not compatible with EF-S lenses. Note! When used with lenses with smaller maximum apertures (f/4 and f/5.6, for example), there will be little difference in image quality as compared with the standard Tamron teleconverters. When used with lenses wider than 90mm, the SP teleconverters can actually compromise image quality. Pro-series teleconverters are specifically designed and optimized for use with ultra-telephoto lenses (above 200mm) to deliver maximum resolution, contrast and color rendition without degrading any aspect of the master lens performance. Improved optical design of 4-group/5-element for 1.4x and 4-group/7-element for 2x. Relative illumination is significantly improved resulting in better overall contrast and resolution across the entire image field. Multi-coated elements result in crisper images. TheSP AF 2X Pro Teleconverter for Select Nikon Lenses by Tamron features improved optical construction and is designed to be used with lenses that are f/4.0 and of focal lengths of 90mm or greater. The 2x teleconverter (also known as a tele-extender) will multiply the focal length of the existing lens by 2x, and will cut back the amount of light by 2 f/stops. For example, using a 2x teleconverter with a 300mm lens will effectively increase the focal length to 600mm. A lens set to f/2.8 will now be f/5.6.